You may wish to read an introduction to this section first. 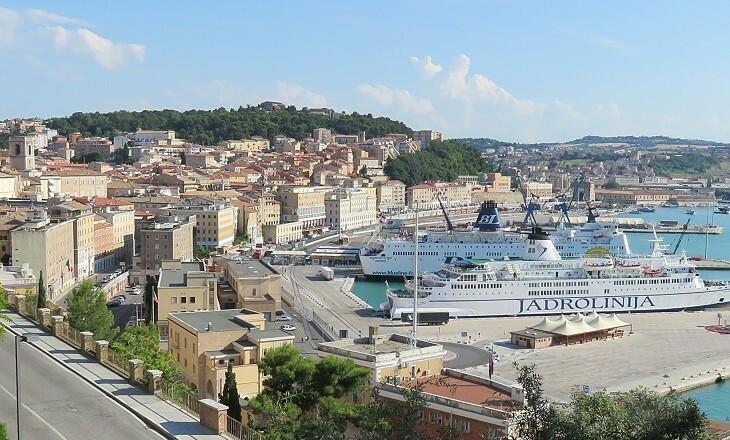 Nothing is seen of Ancona, till the traveller is close upon it. The first sign of its vicinity is the huge fortress, which crowns the peak in which Monte Conero ends, and round the base of which the road winds. The mountain, which, as has been said, rises so immediately from the sea as to leave no space for a road from the southward along the shore, first juts out from the line of coast in that bold headland, from which the Greek founders of the city called it "Ancon", and then receding so as to leave a space barely sufficient, or rather not sufficient for the city, advances again in a perpendicular cliff as close to the shore, as to leave only just room for the gate of the city. (..) A depression of the hill, not sufficient to be called a valley, divides the mountain into two heads. (..) The two headlands thus divided are called, the one Monte Guasco, and the other Monte Astagno. But they are both parts of one and the same mountain mass, Monte Conero. The base of Monte Astagno is topped by the fort above mentioned, - by which is not to be understood a mediaeval fortress, picturesque and useless, but a huge mass of modern fortifications (..) with lumpy earthworks and long straight lines of white wall in excellent repair. In the early XVIth century divisions among Italian States, the rivalry between France and Spain and the religious split caused by the Reformation favoured the Ottoman expansion in the Mediterranean region (establishment of an allied corsair state at Algiers - 1518 and conquest of Rhodes - 1522) and in Europe (conquest of Hungary - 1526). Fears of an "all out" Ottoman invasion of Italy ran high and the inhabitants of Ancona welcomed the decision by Pope Clement VII to build a state-of-the-art fortress on Mt. Astagno, the southern headland which closed off the harbour of the town. 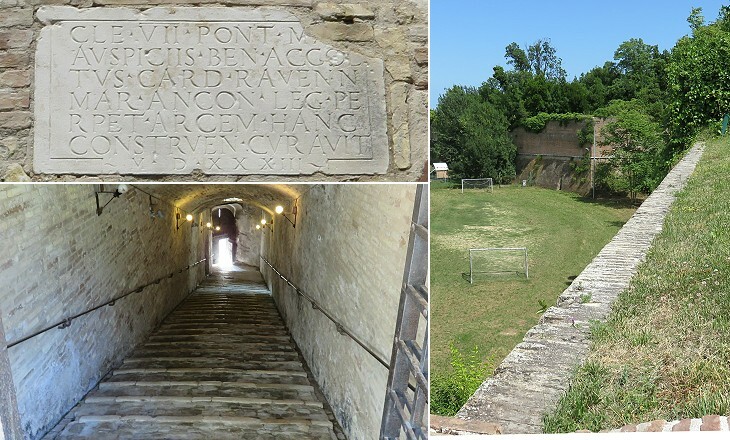 The construction of the fortress by Pope Clement VII was a poisoned gift, because its cannon were first used in 1532 to impose direct papal rule over Ancona, thus determining the end of the maritime republic. Cardinal Accolti was named governor of the town, but he was removed from his position by Pope Paul III on the charge of misspending 19,000 ducats (a Venetian golden coin). 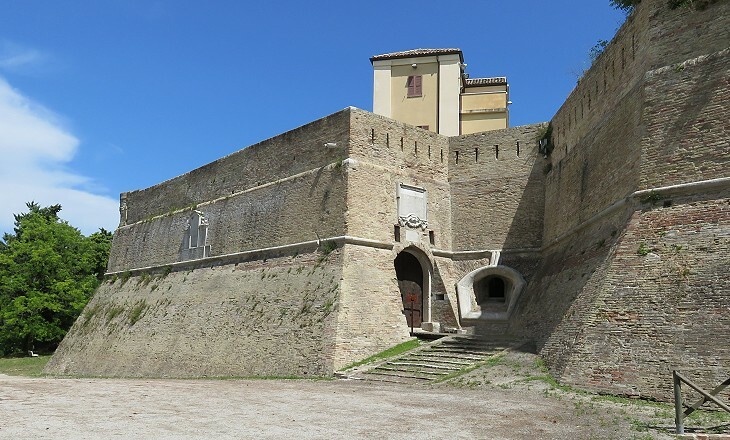 The fortress was designed by Antonio da Sangallo the Younger, a famous military architect (you may wish to see the bastion he built in Rome), but its fortifications were improved in the following centuries. Today it is no longer used by the Italian Army and it is surrounded by high trees which impair its view from a distance. The Ferretti were one of the wealthiest families of Ancona and they opposed Cardinal Benedetto Accolti. Because of this Angelo di Girolamo Ferretti was exiled from the town. He returned after Accolti was deposed and began the construction of a large family palace. The Ferretti understood that the days of the maritime republic were gone and they bought buildings at Ancona and large estates in its countryside. In 1649 Giovanni Maria Mastai, from Senigallia, married a Ferretti and he was allowed to add the latter surname to his own. In 1846 Cardinal Giovanni Maria Mastai Ferretti IV was elected Pope Pius IX. In 1555 Pope Paul IV issued a bull by which all the Jews of the Papal State had to relocate to the ghettoes (walled quarters) of Rome and Ancona. In the latter town the Jewish quarter was situated at the foot of the Citadel. The Jews had to live in the ghetto until 1848. In the 1930s the lower area of the neighbourhood was pulled down to open new streets, whereas most of the houses near the Citadel were rebuilt after WWII bombing. 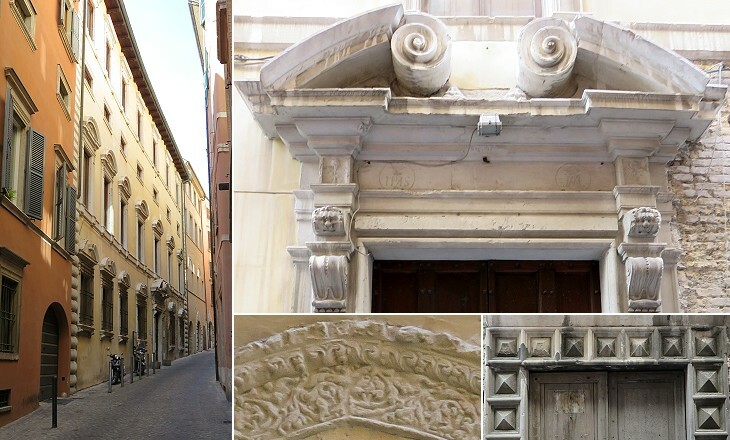 The decoration of a synagogue of Ancona was moved to the Istanbuli Sephardic Synagogue of Jerusalem. The churches of Ancona do not house many works of art of the XVIth century, in part because of the economic decline of the town in that period, in part because many churches were renovated in the XVIIIth century and finally because the effects of WWII bombing and the 1972 earthquake led to moving them to Palazzo Bosdari which houses Pinacoteca Civica "Francesco Podesti", the Municipal Art Gallery of Ancona. 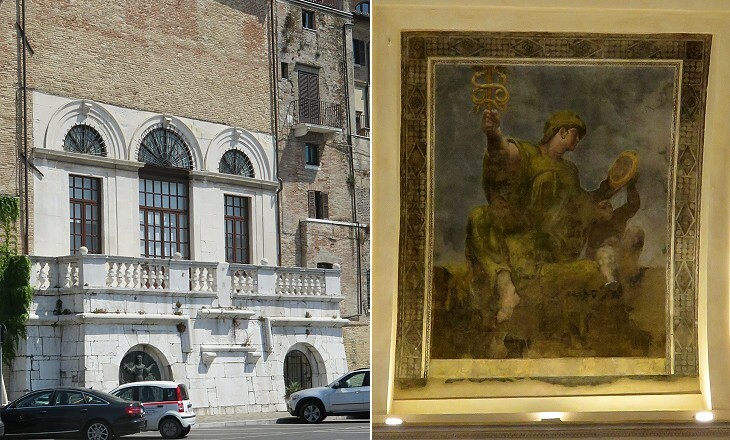 You may wish to see a painting by Titian which was at S. Francesco alle Scale (it opens in another window). 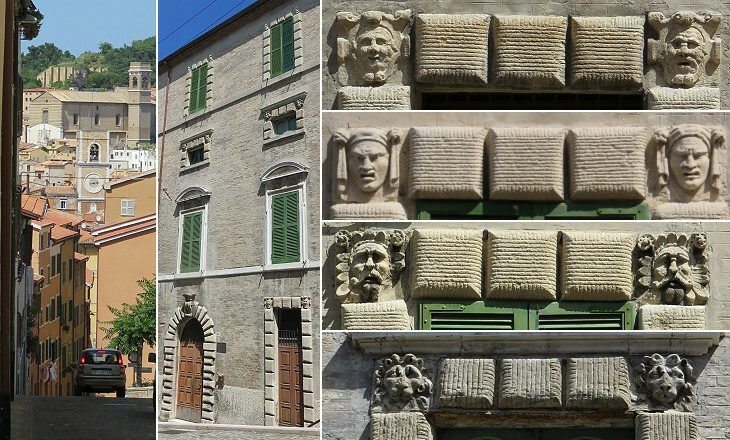 Three architects played a major role in designing the monuments of Ancona: Giorgio Orsini in the XVth century, Pellegrino Tibaldi in the XVIth century and Luigi Vanvitelli in the XVIIIth century. Tibaldi (1527-96) began his career as a painter and in 1547 he was involved in the decoration of Castel Sant'Angelo in Rome. He worked at Ancona between 1558 and 1561. 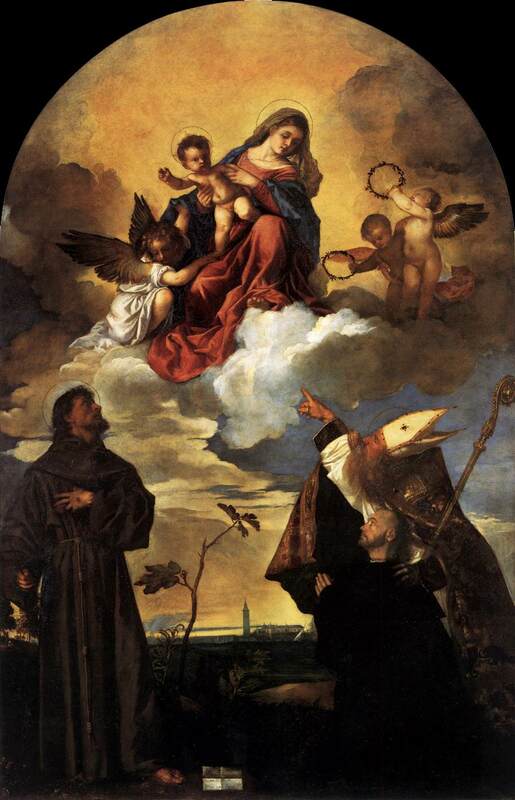 He then moved to Milan and Pavia where Cardinal Carlo Borromeo commissioned him to the design of churches and palaces. In 1556 a fire ravaged Loggia dei Mercanti, a hall designed by Giorgio Orsini and only its façade towards the town was not destroyed. 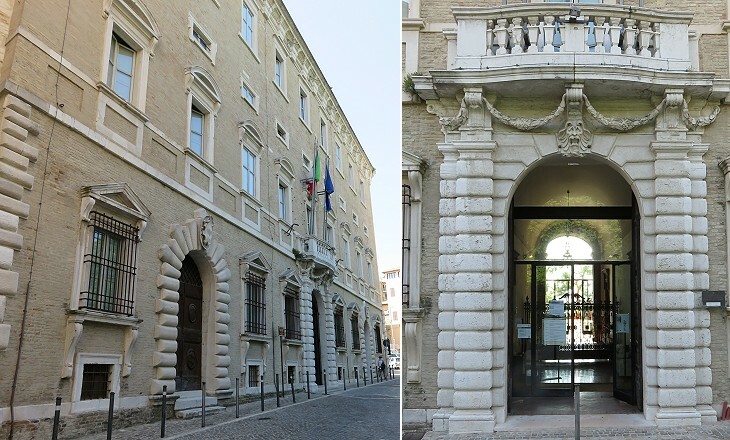 Tibaldi was charged with its restoration which included a new façade towards the harbour and the complete redecoration of the interior. 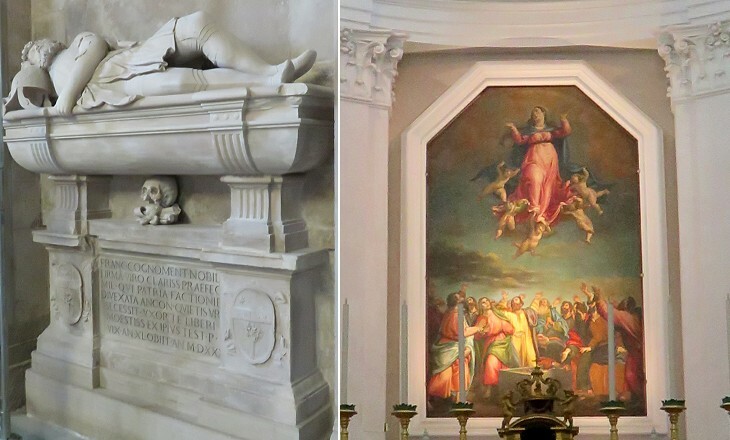 Tibaldi was involved in the task as an architect, a painter and a sculptor (the image used as background for this page shows his statue of Faith). Tibaldi was commissioned the redesign of an existing fountain. It is situated between the two hills and it was named after the reeds (Lat. calamus) which grew in the area in medieval time. 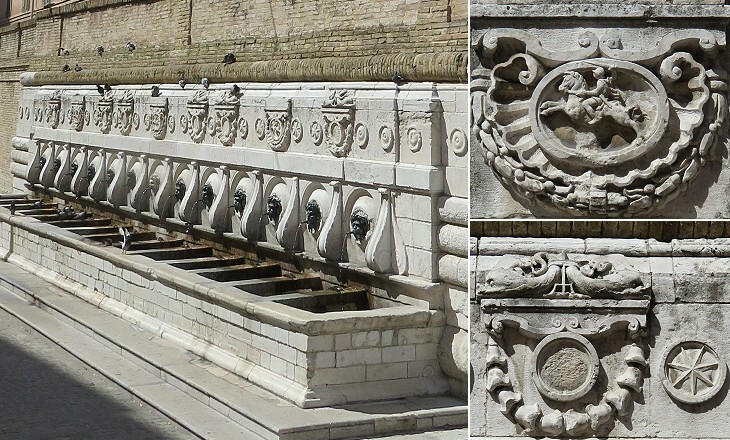 Tibaldi decorated it with typical Renaissance motifs, including some that were based on those of ancient Roman monuments. Some details have been erased, perhaps the heraldic symbols of Pope Paul IV. When he died in August 1559, the Romans reacted to the news by destroying all the coats of arms of the Pope and this occurred elsewhere in the Papal State.